Start your own Inflatalble rental business! For Kids parties a must! An affordable business to start and run from home, mostly required on weekends and easy to control. All our Inflatabless are made from 1st grade, 550grm PVC material, which is locally manufactured, and meets the SABS approval. 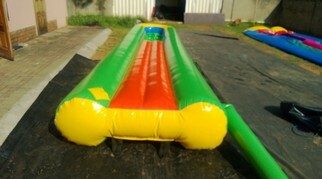 All our Inflatables are double stitched for strength. On all top floors we stitch in webbing for extra durability. All our Inflatables are fitted with a zip for a quick deflation when required. We supply a complete Inflatable with motorblower, carry bag and repair kit. 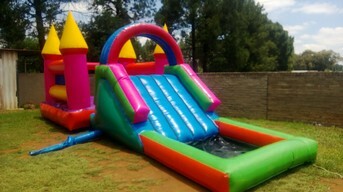 We offer a 12 month workmanship( not wear and tear) warrantee on all our Inflatables. The 220volt motor blower also carrys a 12 month guarantee. Motor blower covers are availble on request at an additional amount. This is a highly profitable business. You can charge for collection and delivery. 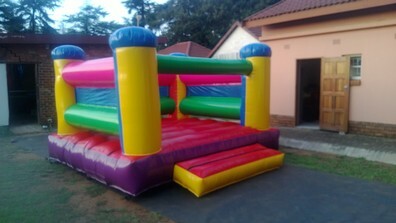 R42 000-00 interest in the bank for a month does not even earn you what one inflatable's rental for a day can give you. We offer different packages to suit your budget. You can also add to your stock to suit your budget.